This welcome antidote to the conventional career guide answers the old question—”So, what are you going to do with your life?”—in a groundbreaking way. 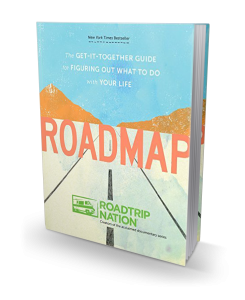 From the team behind the campus and online resource and the inspirational TV series in its eleventh season, ROADMAP helps emerging careerists think deeply about how they can enter the workforce and thrive, using Roadtrip Nation’s interest-based approach. Full-color charts and graphs offer a unique visually engaging reading experience and prompts for reflection are interspersed, making the reading process interactive and the discoveries personally impactful. Interviews and advice from over 130 leaders including Ahmir Questlove, Jad Abumrad and Soledad O’Brien show how they found their path and provide inspiration for every person to find your own. With actionable, real-world wisdom on every page, it’s an essential tool for today’s young professionals and the parents, educators, and advisors seeking to inspire them. 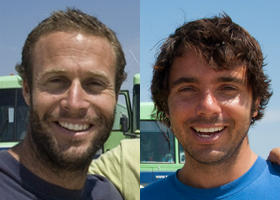 Roadtrip Nation started when fresh-out-of-college grads Nathan Gebhard, Mike Marriner and Brian McAllister hit the road in a beat-up RV to interview people who had forged livelihoods doing what they love. Now, a decade later, Roadtrip Nation has grown into a long-running public television series, an educational organization, and a movement of people committed to living lives true to their interests. Nathan Gebhard is the cofounder and creative director of Roadtrip Nation, where he oversees Roadtrip Nation’s multimedia content and career exploration resources. Brian McAllister is the cofounder and operations director of Roadtrip Nation, where he oversees Roadtrip Nation’s day-to-day operations. Mike Marriner is the cofounder and head of business development at Roadtrip Nation, where he oversees Roadtrip Nation’s sales, marketing and partnerships.